Kathy is saddened by and opposed to the falsehoods and harmful actions coming out of Washington, D.C., under the Trump Administration. She was finally able to write about these feelings, then went into the studio with musician/producer Steve Dawson to record the song “Riding Low.” You can download the song for free here. Kathy wrote several of the songs for her newest project, Halos Are History, based on recent travels and historical research. Kathy grew up feminist and Roman Catholic, and although these days her spiritual views are less clearly defined, the songs on Halos Are History were inspired by women who became Catholic saints. Once again working with producer/musician Steve Dawson, the songs are also the nucleus of a Web-based project, www.HalosAreHistory.com. The new site offers music, historical context, vintage and travel images, and Kathy’s stories about her connections to the people-turned-saints who inspired the music. The project launched with a sold-out concert at the Filament Theatre. Thank you to WLUW-FM deejay Tom Jackson, who named Halos Are History as one of his favorite albums of 2017! Mike Bennett of CHIRP Radio (Saturdays, 9 to noon). Tune in to his show at www.chirpradio.org. Tom Jackson of WLUW-FM (“Somebody Else’s Troubles,” Saturdays, 11 am to noon) interviewed Kathy in the studio. Tune in to Tom’s show each week at 88.7 FM or www.WLUW.org. Razor and Die of WLUW-FM (Fridays, 4 to 6 pm). Tune in at 88.7 FM or www.wluw.org. Interview on Celtica Radio in Wales: Thanks to deejay Bill Everatt at Celtica Radio, who interviewed Kathy about the Halos Are History project via Skype. Kathy’s new songs also are on the Welsh station’s playlist. Tune in worldwide at www.CelticaRadio.com. Pandora is now streaming the songs from the Halos Are History album. Listen here. Deejay Richard Milne hosted his final Local Anesthetic show with his annual Holiday Spectacular on Sunday, December 24, 2017. The show featured original musical greetings by local musicians, including Kathy. Kathy thanks Richard for his support of local music over the years! Kathy debuted her album, The Pilgrim, in June 2016 as part of a sold-out concert at Szold Hall at Chicago’s Old Town School of Folk Music. The show was a double-album release event, also featuring new music by her good friend, songwriter Melanie Budd. About The Pilgrim . . .
For her sixth album, The Pilgrim, Kathy worked once again with musician/producer Steve Dawson. The recordings come on the heels of Kathy’s recent pilgrimages to Spain, Rome, and Paris. Lyrically, they ponder spiritual ideas and also honor the memory of her sister, Lynn, who was a traveler and citizen of the world. Preview songs and purchase the album here. The Pilgrim was fortunate to be reviewed by top roots music website Americana UK. Read Paula Cooke’s write-up here. Gabor Kleinbloesem of the Netherlands’ Strutter’zine wrote a nice review of The Pilgrim. Read it here. The Pilgrim was accepted for streaming on Pandora, so you can now listen to the album’s songs (and discover music by similar songwriters) at Kathy Greenholdt Radio. Thank you to Chicago’s radio deejays for playing tracks from The Pilgrim. Songs have been featured on Chicago’s WXRT-FM, WLUW-FM, CHIRP Radio, WDCB-FM, WNUR-FM, and WVLP-FM. Thanks to Bill Frater for playing “Blue Girl” on his Freight Train Boogie Show #349, out of Santa Rosa, CA. Listen to the full show here. Kathy was excited to be part of Niala Boodhoo’s WBEZ-FM “Afternoon Shift” segment on finding success at any age. Listen to the April 2015 program at this archived link. 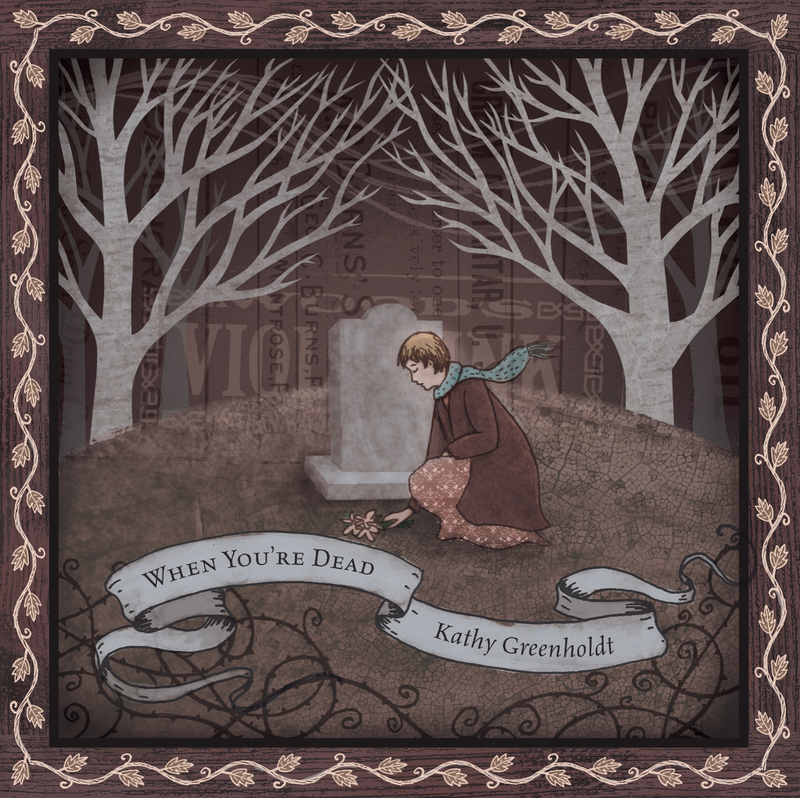 Kathy’s latest album, When You’re Dead, is now on Pandora.com. Listen to Kathy Greenholdt Radio here. Host Michael Teach welcomed Kathy and Steve Dawson for Episode 534 of the Chicago Acoustic Underground podcast. To listen to the interview, see photos, and watch a video of the in-studio performance, visit the CAU Website. Folk deejay Lilli Kuzma of WDCB-FM’s Folk Festival show named Kathy’s When You’re Dead album to her “Faves” list for 2013. Tune in to Folk Festival every Tuesday night, from 7-9 pm, at 90.9fm or wdcb.org. WXRT Deejay Richard Milne will feature musical holiday greetings by Chicago-area bands and songwriters (including Kathy) during his annual “Local Anesthetic Holiday Spectacular” on Sunday, December 15, at 7 pm (rebroadcast on Sunday, December 22, 7 pm). Listen to WXRT (93.1 FM) live or stream the show here. There is now a new purchasing option for the When You’re Dead CD: you can order it on the Barnes & Noble Website. And, if you live in Chicago’s South Suburbs, you can pick up a copy at the Orland Park Barnes & Noble (160 Orland Park Place, 60462), where the songs are being played in-store! Thank you to Theresa Marketti at the Orland Park store. Many thanks to Steve Zagata for creating a video for the song “Prayer to Saint Joan of Arc.” The video features archival footage from the 1927 silent film, “The Passion of Joan of Arc,” directed by Carl Theodor Dreyer and starring Renée Jeanne Falconetti as Joan. View the new video here. New Album Added to More Than 140 Radio Stations! When You’re Dead has been added to more than 140 radio stations across the U.S. Many, many thanks to the Music Directors and deejays at these stations! Thanks also to the folks at Tinderbox Music in Minneapolis. Thanks to Lilli Kuzma, host of the “Folk Festival” show on Chicagoland’s WDCB Public Radio, and to Bill Frater, host of the Santa Rosa, CA-based podcast, “Freight Train Boogie,” for including Kathy’s music in their shows. Richard Milne featured “The Light” and “When I Dream” from Kathy’s new album, When You’re Dead, on his WXRT-FM radio shows, “Local Anesthetic” (April 28) and “Local Anesthetic Capsule” (April 22 and 28). You can listen to the full April 28 “Local Anesthetic” show here (Kathy’s segment comes in just after 8:40). Kathy was a guest writer for the weekly nature blog, City Creatures, hosted by Chicago’s Center for Humans & Nature. Her piece features the Spring-related song “The Light.” Check it out here. KBBI-AM, the NPR affiliate in Homer, Alaska, broadcasted “Prayer to Saint Joan of Arc” from the When You’re Dead album as its New Music Shelf feature for the week of March 17! and Celtica Radio (Wales), with host Bill Everatt, on Friday, March 8. Kathy is excited to be one of the songwriters featured on the cover of the 2013 edition of the Indie Bible, a resource that has been used for fourteen years by songwriters worldwide to connect with music media, promoters, record labels, and more. Thank you to talented photographer David Sameshima for shooting Kathy’s photo! Thanks also to Songsalive!, the organization that awarded this opportunity. Kathy is a Pro member of Songsalive!, an international songwriting community based in Los Angeles. Learn more about the Indie Bible here.
. . . to the Chicago Music Commission, who invited Kathy to participate as a panelist at the Musicians At Work Forum, “Recording and Manufacturing an Independent Music Project.” The forum is posted here, and you can also listen to other past Musicians At Work Forums at that same link.